Khenpo Kartse, a respected Buddhist teacher and community leader currently in Chinese prison was among the individuals and groups honored with Lhakar Awards in New York City on Saturday, August 23rd during Students for a Free Tibet’s (SFT) annual benefit event. SFT held a ceremony to honor Khenpo Kartse (in absentia), and other winners of this year’s Lhakar Awards, which was instituted in 2010 by the New York based student group to recognize contributions to the Tibetan struggle. Khenpo Kartse won the Lhakar award for Resistance “for his social work, cultural promotion and environmental protection in the face of China’s persecution. “Lhakar is a homegrown people’s movement that emerged in Tibet in 2008, but has now spread across the globe, making it a force that unites Tibetans inside and outside Tibet”, said Tenzin Dolkar, SFT’s Executive Director. “Through seemingly apolitical actions such as wearing Tibetan clothes and speaking Tibetan, Tibetans in Tibet are directly challenging and resisting CCP policies. 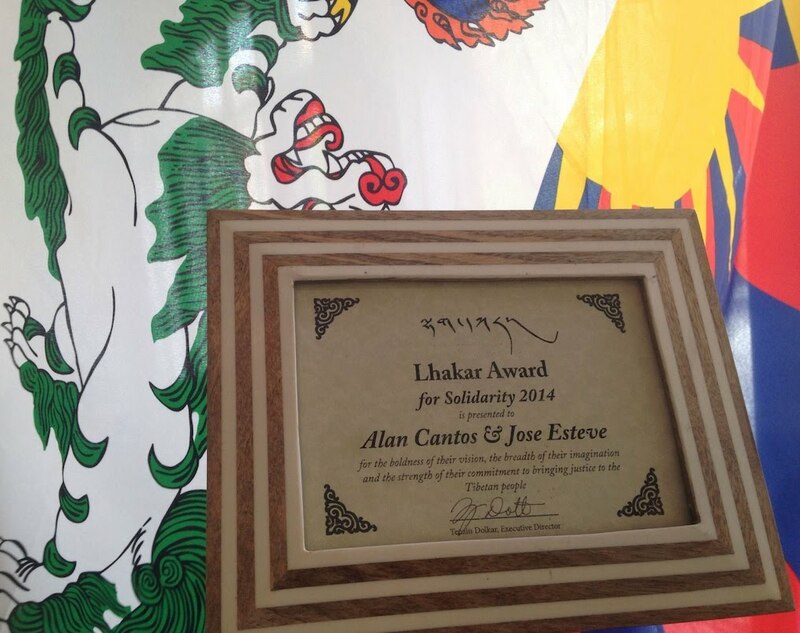 Jose Elias Esteve & Alan Cantos were given the Lhakar Award for Solidarity “for the boldness of their vision, the breadth of their imagination and the strength of their commitment to bringing justice to the Tibetan people”. Their historical lawsuit in the Spanish court resulted in arrest warrants for 5 top Chinese officials, including former president Jiang Zemin. Jose is unable to record his own message at this time so I will be talking on behalf of both. We are truly touched by this award and recognition that you are giving us. It is almost 15 years ago now that Jose started his amazing work to study the legal history and status of Tibet in international law and wrote the first lawsuit. I was glad to help him. We submitted two criminal lawsuits to hold Chinese officials accountable for international crimes committed in Tibet. Our courts accepted and investigated the crimes of genocide, torture, crimes against humanity, war crime amongst others. We had no idea of the obstacles we were going to face. We were able do it because from the beginning we focused on the victims and their families, we were inspired by their courage and example of resistance. The rest is noise, really. We want to be able to say Never Again! We have always thought that International Law is a peaceful and way to resolve difficult conflicts. It is also an excellent way of campaigning for truth and accountability, therefore we believe it has the elements of ACTIVE non-violent resistance based on truth and facing the opponent, that is of Satyagraha. As we have seen in Cambodia, Guatemala, Chile, Argentina etc, International Law and Universal Jurisdiction, despite its imperfections, is a powerful tool to recognize certain crimes and stop impunity. It is a vital pillar of modern democracy. Your award will help us keep up the legal fight this time against our own government who in shameful and complicit submission to China has temporarily shelved the Tibet case by a brutal and sloppy reform of our law. Our government has massacred the vital independence of the judicial in Spain, and threatens to close all the other UJ cases. We will not rest until this indignity has been reversed and the Tibet case and the judicial independence is restored. Other lawyers in other countries should take note of this, present lawsuits against rampant impunity in Tibet or Gaza or elsewhere and learn to say NO! Basta! to the perpetrators. Thanks to your support as ACTIVE and courageous Tibetan campaigners, with this award it is easier to never give up. Thank you from Jose and I. It is a great boost to our work!